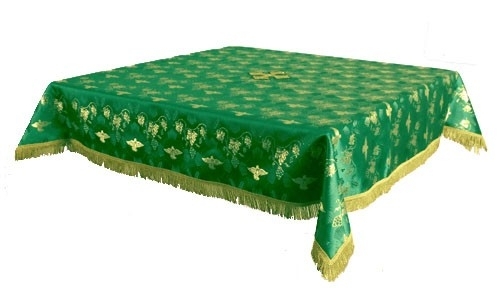 Liturgical Holy table covers (green-gold) by Istok Church Supplies Corp.
Feel the glory of God at the Holy Altar with a splendid green-gold Holy Table cover. 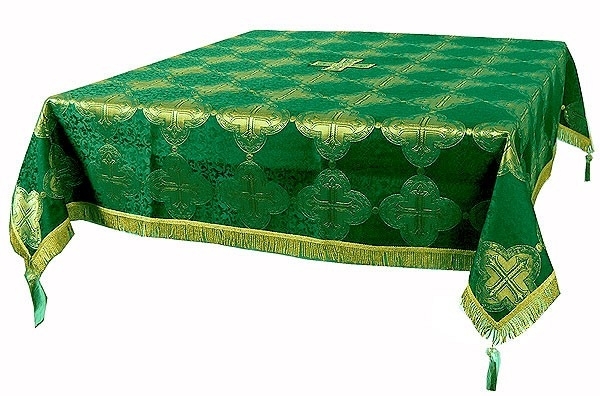 Istok Church Supplies presents a superb collection of unique and finely crafted Holy Table covers at unbeatable prices. 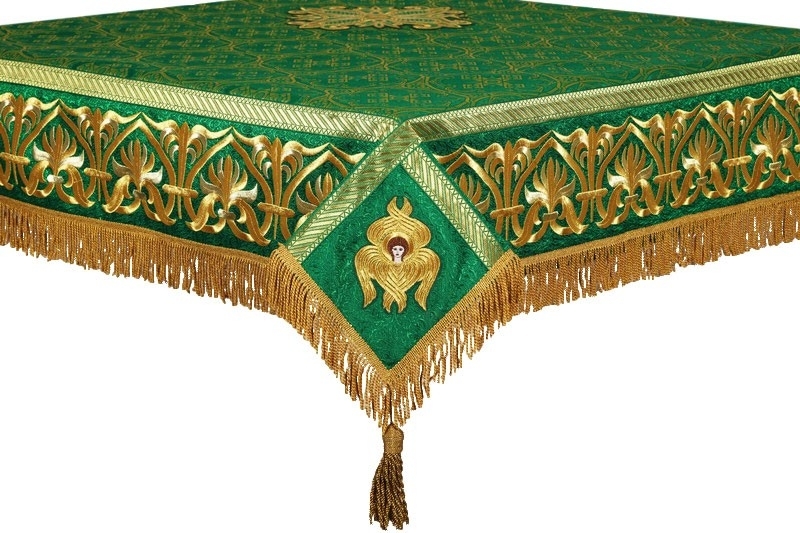 Representing God’s Throne, the Holy Table is one of the most important furniture articles at the Holy Altar. 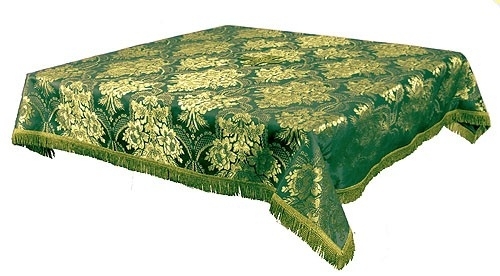 It is traditional to cover it with a bright, high quality fabric. 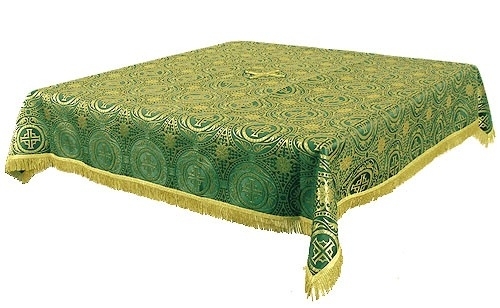 Our green-gold Holy Table covers are perfect for this purpose and are especially suited for important occasions such as days honoring monastic saints and ascetics. 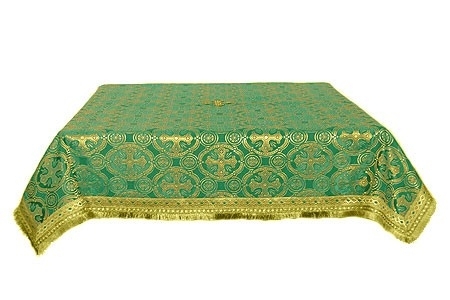 We offer these covers in a choice of lavish ecclesiastical fabrics including rayon brocade, metallic brocade, silk and embroidered fabric. Featuring Christian themed patterns and designs, they are sure to elevate church interiors with their beauty. 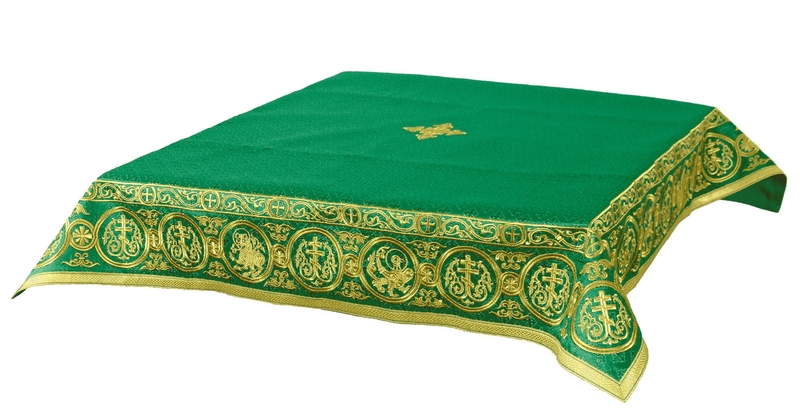 The green-gold Holy Table covers we create are in keeping with the spirit of Orthodox Christian traditions and cultural inheritance. 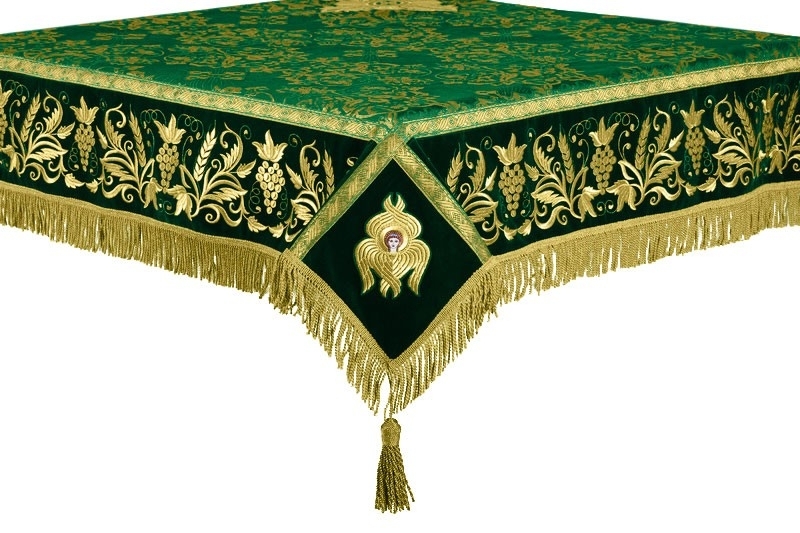 Our Holy Table covers are reasonably priced and prices mentioned are for Holy Table covers that measure 55”x55”. 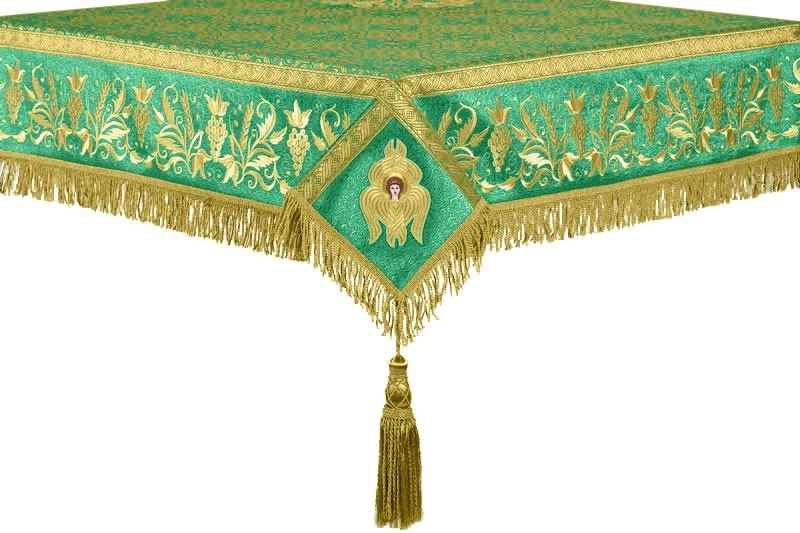 We welcome custom orders and can easily create a bespoke Holy Table cover that would be a perfect match for your requirements. Please make your request in the Notes section of your order and try to place your order early as it may take time for us to process your order, especially during peak season. 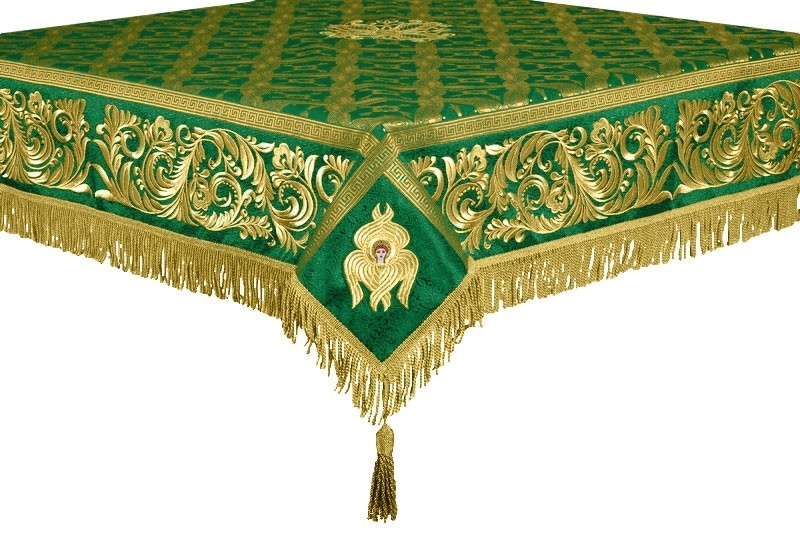 Whether you prefer an embroidered Holy Table cover with Protection of the Theotokos as the theme or a dazzling cover made from rayon brocade material, you can be sure that it will be of high quality and complete with decorations along the edges. We encourage customers to register themselves so they can take part in our Loyalty program and earn cashback bonus points with each purchase. Bonus points can be converted into Gift Certificates and used for future payments. We are happy to serve Orthodox Christian churches and individuals around the world. Take a look at our bestsellers for inspiration!